This was the first time that I had been introduced to many of the family, we had considered my children's participation but figured it better to move slowly. I'm sure that my son would have had everyone playing the peg game so probably a sensible approach. It was a shame that more friends didn't participate, although as I have found it's the best friends that are always there when required most! 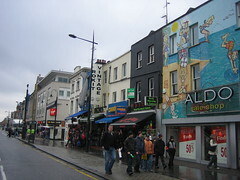 After the majority of the birthday cake and alcohol had been consumed we decided to move onwards to Camden Town. The typical journey was accompanied by a separation into two groups at Mornington Crescent. This wasn't intentional but neither was awarding a ten to the person that dived into the floor, sharing a burger with strangers or exchanging jackets with security staff at a bar and then banishing them from the premises with their 'shield'. We were eventually reunited and somehow ended up with a notepad, several notes later we were writing on each other; visions of Newcastle with the original cast!